You may recall my post about Googling autism and the horrific things that popped up. I then did a follow up, sharing Google’s response as well as my findings on other popular search engines. On the whole… the results look pretty similar to the way they did 3 months ago. Some things have changed…slightly…like some of the #1 suggestions being positive rather than negative. But there is certainly still work to be done, as at least half of the searches still propose murder. I get that some people will always think those with autism are “annoying” or “rude”. And as much as I wish that wasn’t the case…I know that ignorance and entitlement to opions are going to exist. But, death wishes are unacceptable. This kind of hatred needs to end. Any response, Google?? So, I’d say that sounds pretty good. They know it’s happening. They agree it’s wrong. They’re going to fix it. And, I’ve been personally assured that at least 1 person out there at Google will fight this fight alongside the rest of us. I believe the only thing left to do (after fixing it of course) is for Google to publicly acknowledge what happened, and how they feel about it. I know the autism community would appreciate the support. I look forward to progress being made here. It appears Yahoo! has put something into place to block any suggestions from coming up when you search “need” or “should” in relation to autistic people. Good for them! And I was pleased to see the positive choices that come up when searching about autistic people. So besides a few that still slipped through (which I hope Yahoo! will address and delete), Yahoo! offered significantly more positive options, and significantly less hateful ones. Ugh. Several suggestions of death, danger, and evil. Not good!! Ah-hah….just like Yahoo! it appears Bing has blocked any results from popping up for a couple of those phrases. Good effort! Unfortunately, although they’ve safe-guarded “autistic kids should”, searching “autistic people should” still resulted in a death suggestion. So, they’ve still got work to do! 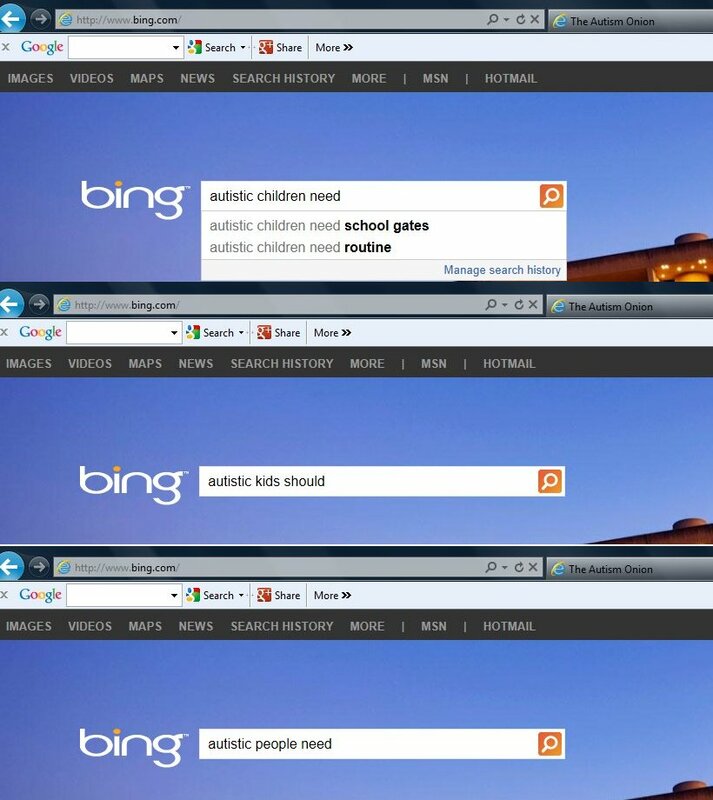 Bing certainly needs to clean up some of the suggestions they offer up regarding autism. Overall, Yahoo! 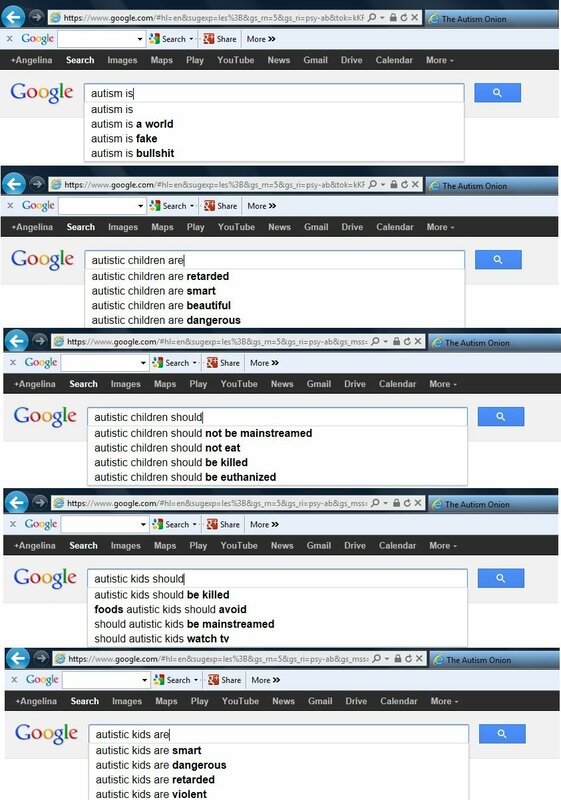 seemed to offer the least damaging results when searching about autism. In comparison to Google, their results were significantly less inflammatory. Google remains the most saturated with hateful suggestions. And Bing seems to be in the middle, offering both very negative and some positive results. 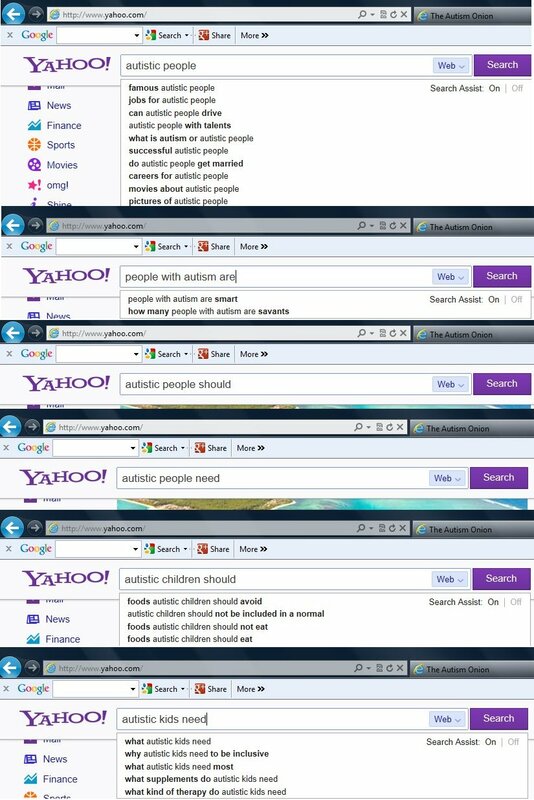 My take-away- The fact that these search engines are displaying disturbing content in regards to autism boils down to the simple fact that THOSE are the most common searches conducted. The search engines need to take responsibility for what they are allowing on their websites, and should be actively working to eliminate the hatred they are promoting. But the bigger picture is not about a website that automatically offers popular searches…. 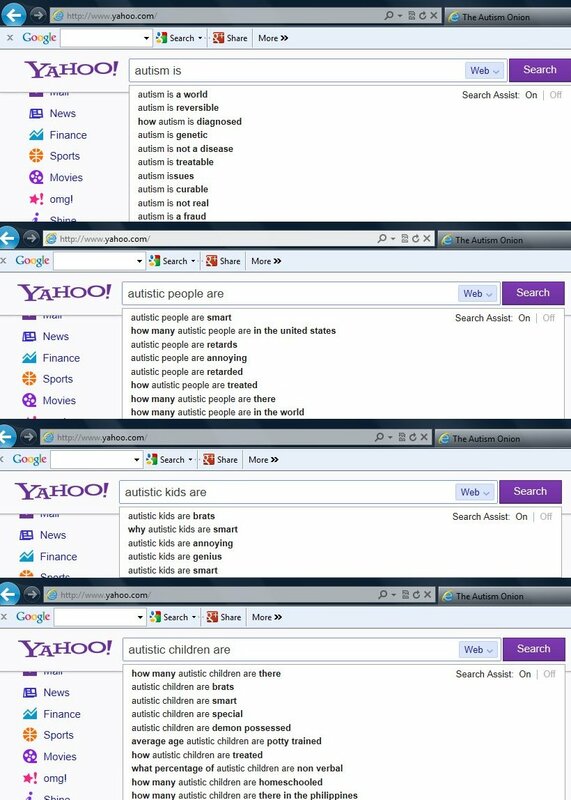 it’s that the most popular searches about autism are hateful, violent, and just plain evil. It’s that the world at large still has dangerous attitudes and beliefs about people with ASD. I cannot wrap my head around what would possess someone to sit at their computer and type that any people group should “die” or “be killed”. I’m baffled at why ANYONE would say those things, much less why A TON of people would say those things. It’s depressing that with all the knowledge out there that people are still so uninformed and so aggressive towards people with autism. How could people out there think these horrible things about people like my little brother? I don’t understand. All I can hope is that once these search engines have fully erased all the hateful suggestions, people will start seeing positive things pop-up about autism. And, maybe…just maybe…that exposure will change people’s minds. Beyond that, we in the autism community can continue to do our best to promote acceptance and understanding, letting our patience and love be an example to others. We live in such a sad and broken world…. I read an article today stating that Google’s “auto-complete” feature (which gives you suggestions as you type to help finish your sentences, based on the most popular searches) is working to get rid of hateful suggestions for autism related searches. 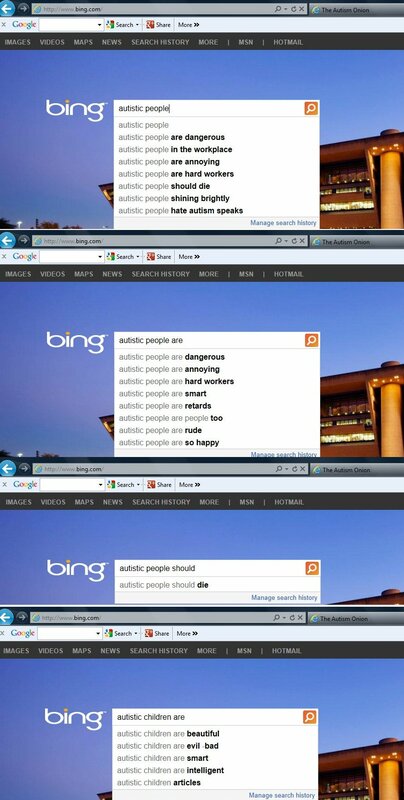 Apparently when Googling about autism, some horrible things would come up. I had no idea. The article I saw said Google would fix this issue. Phew! 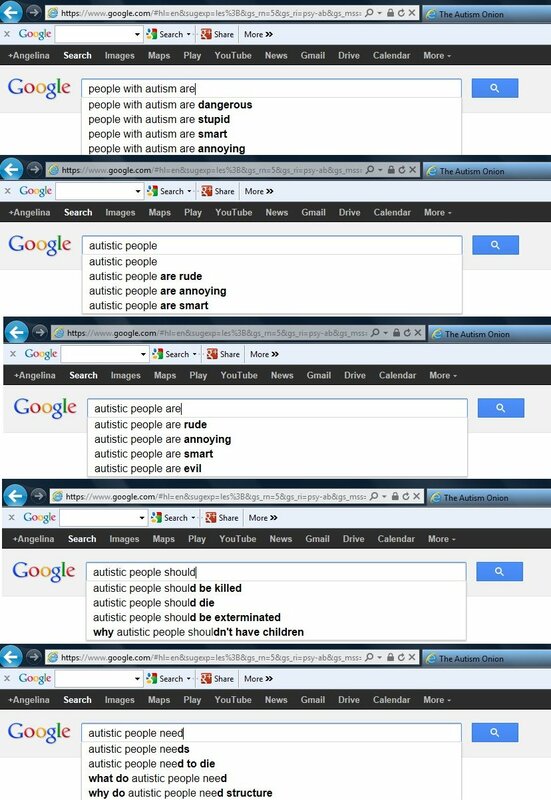 But, I decided to Google various autism related word combinations and see what suggestions would appear….Just in case…. ***Disclaimer*** Please be advised: The language and suggestions below are disgusting. So… who’s to blame? Google??? Well… partially. There are certain phrases that just shouldn’t pop up when you’re searching something. They should take responsibility for what they are actually “suggesting” that people search. But how do they even come up with these suggestions? They’re based on the most popular searches! So who else is to blame?? Whoever is searching these phrases! Is this real? Do people really type these things into their browsers? 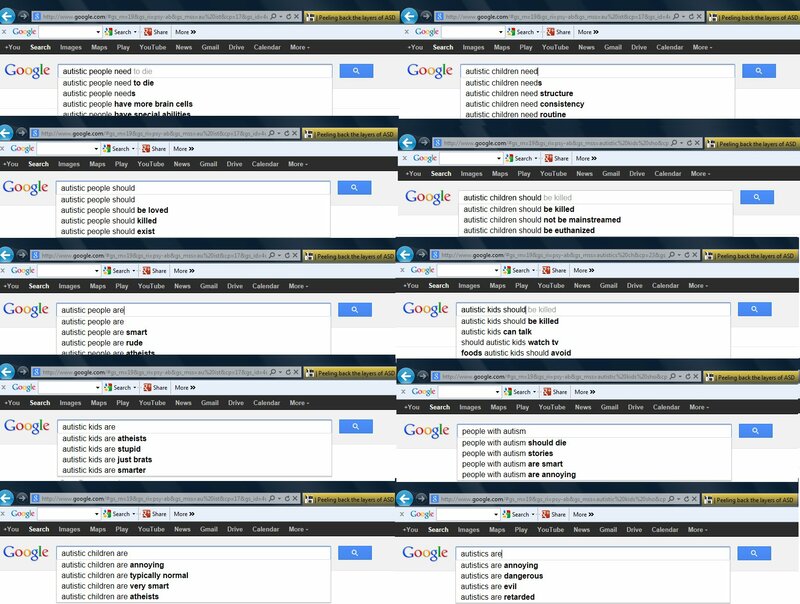 Who is searching these things? What are they trying to find online by typing these things? I don’t understand. But, I guarantee that these “suggestions” popping up when people are searching OTHER autism related phrases is only helping to perpetuate the myths and fears and misconceptions. Heck, if I Googled a disorder I knew nothing about and the first things that came up were “violent”, “evil”, “dangerous”, “retarded”, “rude” and “should die”…I’d be freaked out!!! I’d be pretty afraid and I’d want to keep my distance! So…my guess is, by Google offering up these choices for people to select from when they’re typing about autism, people end up clicking on those options, even if that’s not what they intended to search for originally. Therein lie the issue. People clicking on these suggestions (because they’re what pops up) likely contributes to making those phrases the “most searched”. Thus, they keep showing up as suggestions. It’s a terrible cycle! So…short of every person who is outraged by this Googling POSITIVE autism related phrases in an attempt to make those the most searched terms… what can be done?